Property 2: "Sky House" Amazing Views and luxurious. Best place to stay!! Property 8: Poppy Apartments ~ Stunning Views! Property 10: Waterfront Vista in Wyuna Bay. Property 14: A hop, skip and jump from the door into the water! Property 18: Stylish and Peaceful Heritage Listed Cottage - 4 bedrooms & 2 bathrooms. 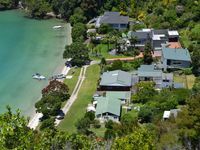 Property 24: Bay Watch ~ Wyuna Bay ~ Stunning Harbour Views! Property 30: Fisherman/Family/Friends - Close to Beach & Township. WIFI and Sky TV. 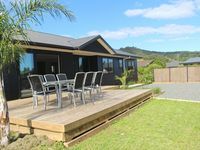 Property 45: Coromandel Treasure a little hidden gem. Quiet, relaxing, great attractions, happy kids! A thoroughly enjoyable holiday. The house was well equipped and in a lovely quiet location still close to town. Kids enjoyed the swing ball and cricket set. Highly recommend. Thanks Zoe.